If you have read any of my posts, you know that over the past few years, I have made hundreds of thousands of dollars through the print on demand industry; specifically Merch by Amazon. 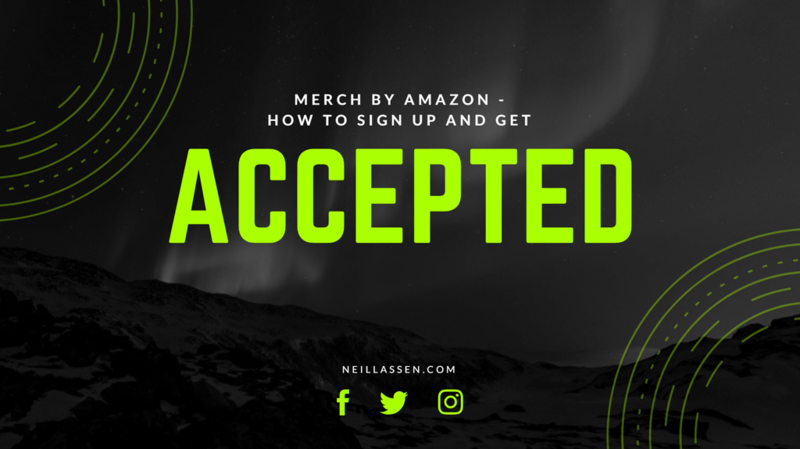 If you would like to follow in those footsteps and getting your feet wet, the first part of the entire process is to actually apply for an account with Amazon Merch. 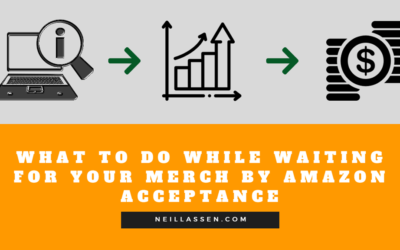 The signup process for Merch used to take only a few minutes and left you waiting for months (in some case over a year) for approval. Luckily for you though, the application process has changed! These things are required during the signup process before you get accepted so you will want to make sure you have them available while you are filling out the application. Note: Following this guide does not mean you will get accepted. These are just simply the best practices so that you stand the highest chance of getting an acceptance email. Let’s go through the signup process step by step with some hints on what you can do along the way to stick out to the Merch Team. You can either Google “Merch by Amazon” or simply click the link here: https://merch.amazon.com/landing but you will need to get on their landing page to begin the process of signing up. The landing page will explain a little bit about the program so you should know what to expect. If you want to get a bit more in depth information, then you will want to read the ultimate merch guide that I wrote here. Click on the big orange “Request Invitation” button to begin the process. 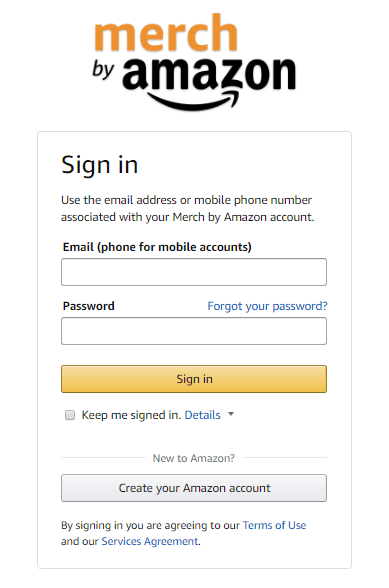 You will either need to sign in to your Amazon account that you already have, or create a new one. I personally like to keep different accounts separate so I can track certain things, but if you want to stand the best chance of approval, it would probably be best to use an account that you have had around for a while. When you apply, you will need your personal information or your business information depending on how your business is set up. If you do not have an LLC that is just fine! You will simply need your name. You will also need your banking information so an account number as well as a routing number so that you can get paid. Finally you will be asked to fill out a tax questionnaire so Amazon knows wether they need to withhold taxes from your earnings or not. After you have all that information handy, simply click on the “Begin Application” button and let’s get started! Setting up a company for your business is probably the smart move here, but if you do not have one yet, that’s okay. You can always set one up later after you start making some money with the program. You want to make sure that everything you fill out here is your real information. If you make a mistake here, Merch by Amazon will be able to catch it and if it does not match up with who you are, you will more than likely be denied. They want honest sellers on the platform. When it asks for a business email address, enter in the address that you use most often. This will be where you get emails for important information and surveys from Amazon when they come out. On the next page where it asks for your bank details, fill out all of the information. It would be helpful to have a blank check in front of you to make this process easy. I have seen people worried about entering in this information, but Amazon is one of the biggest companies in the world and there is literally no other way to get paid so make sure you fill it out! The final step is to work through the tax questionnaire. This is a quick process for anyone living in the USA. 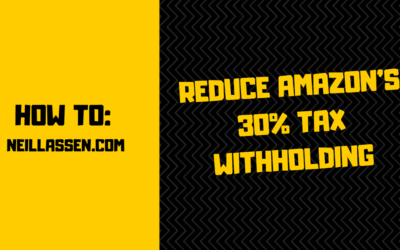 If you are not living in the USA and your country has a tax treaty with the USA, you will want to make sure you avoid the 30% tax withholding. If not, Amazon will withhold 30% of all your earnings for you. Now that you have filled out all the personal, banking, and tax information, you can proceed to the actual invitation form which is the real application. Use the drop down menu to pick what kind of business that you own and operate. If you have a business (meaning you have an LLC or other actually incorporated business), then you will want to put down that you are a small business. More than likely, that will not apply to you yet, so make sure you use your personal name and select that you run a novelty t-shirt business. If you are not running your own incorporated business, then enter in your personal name. If you are such as an LLC / S Corp / C Corp then you will want to enter the legal name of the business here. This is where the majority of your time should be spent during the application. When it comes down to it, it will be the information here that gets you in the door, or gets the door shut on you. You will want to make a case to Amazon on why you are an asset to their program and that they should accept you. Think about what Merch is going to want out of the people in the Merch by Amazon platform? Do they want people with experience? Do they want people who are going to put in effort? If you have never done anything in the POD (Print on Demand) industry before, then I would highly consider creating some designs and putting them up on other platforms before you apply for a Merch by Amazon account. This is going to show that you have put in the leg work and that you are going to be an asset to the platform. 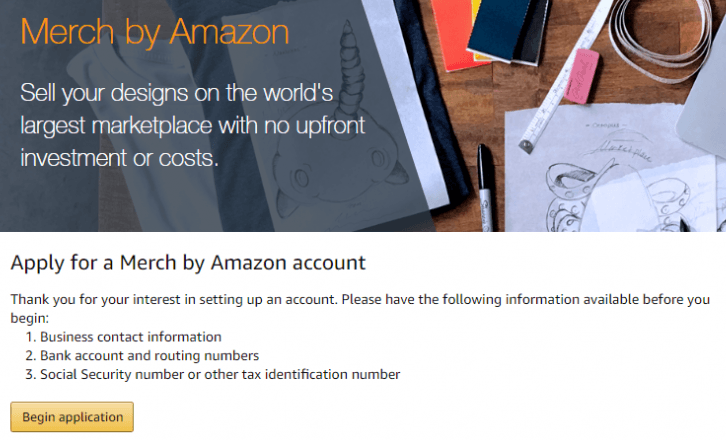 By putting some designs up on other platforms, you can show Amazon that you are willing to make THEM money, which in return is going to allow you access to Amazon buyers making you a lot of money in the long term. I have always recommended getting 10-15 designs created before an application and then uploading them to other platforms. If you are not a designer, head on over to the software company that we founded and use the included Merch Designer. There are so many other print on demand platforms out there but these are all something that Amazon will recognize and that you have put in the time beforehand. Not only that, but the Etsy+Printful integration will actually make you a LOT of money if done right (tens of thousands a month). Once you have your links of products up and optimized (and unique! ), then put the links in your application! When it comes down to the additional information, you want to put any other things that will be relevant to this MBA business. If you know any artists, put that information here! If you have a trademark on anything, this is relevant! If you have licensed art from someone before, this is also something you want the team to know. If you have experience running paid traffic, you want to make sure you include that as well! Finally, if you have any graphic design training, always put that here, or if you have taken any classes on the internet. Remember that they want people who will make the program a success, so put some effort into your response. Hint: It is okay if you do not have anything listed above and have no experience. You should be honest with the Merch team and tell the what you do have. At the very minimum you should have some links from the platforms above that you can include. The website box says that including a website is optional. That being said, if you want to make yourself stand out then this is NOT optional and you will want to build one before you apply. This shows the team that you have a portfolio, and that you have some sort of internet presence. If you have an external website, this can also help you make more money in the future as well. For now though, know that less than 1% of people that apply actually have a functioning website, so THIS is what you want to do to make sure you are at the front of the list. Setting up a website is actually crazy cheap, and very very VERY easy. Click on the link below to check out our guide on how to set up a WordPress website. Now that you have the entire page filled out, submit your application! That’s it, you have now applied for Merch by Amazon! 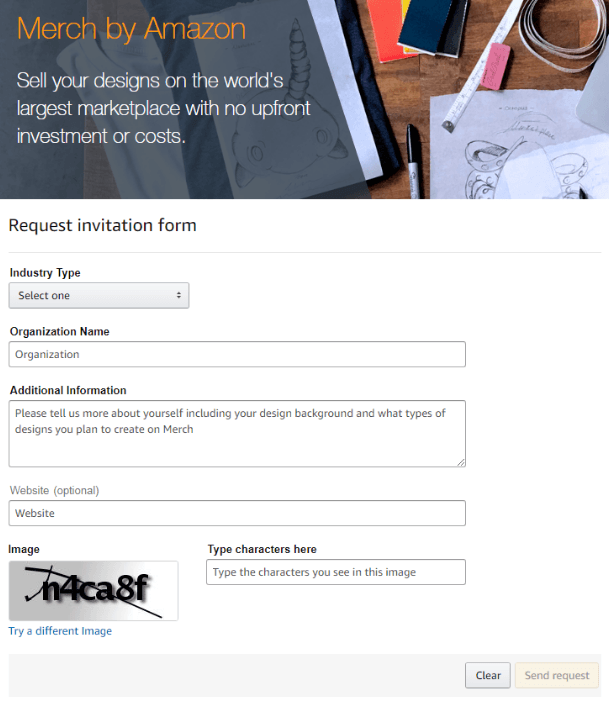 However, after you have applied you will see that they give you some templates to get started creating designs. If you have read my guides, then you should already have these templates and be well on your way. If not, make sure you download them and start learning how to research and create amazing unique designs that customers will want to buy. Make sure you read through the entire Merch by Amazon guide I put together so you know the rules and do not make any early mistakes! It is very important that you take the proper time to make sure everything is set up for your success. If you apply and then get denied for Merch by Amazon, then you will not be able to reapply. They always deny applications for a reason, and you will never know exactly why. If you took the time and effort to honestly fill out the form, then the chances that you get accepted are very high. 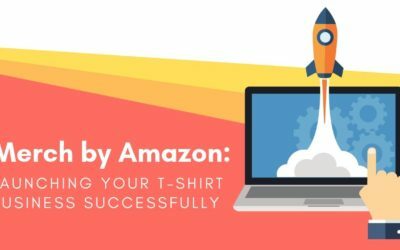 Merch by Amazon wants to make sure they give everyone that is willing to put in the time and effort the opportunity to make money from their incredible traffic. If you are in that demographic of quality people and have filled out your profile, then you shouldn’t wait till you get accepted to start learning more. Start reading articles, start watching videos, and soak up as much information as possible. As soon as you DO get accepted, you will be ready to hit the ground running and start making your very first sales on the biggest POD marketplace in the world!